Cancer is quite a hot topic in the scientific research community today, due to the obvious lack of knowledge underlying certain biological processes. Without the mastery of these biological pathways, it is not feasible to devise surefire treatment and/or prevention methods against specific types of cancer. One does not have to look very far to find criticism or an attempt at exploitation of these biological voids by the media. Despite the frequent scrutiny, the field of oncology (the study of tumors/cancer) has improved exponentially in understanding the manifestation, diagnosis, prevention, and treatment of cancer. A simple look at the declining morbidity rates of cancer patients over the last few decades should provide some comfort even to the most skeptical individuals. Despite the frequent advances in cancer research, the findings manage to fly under the radar of mainstream media. It lies within these small findings, which are the basis of future treatments and cures. Recently, a group of researchers came one step closer to solving their life saving puzzle. The study, conducted by researchers at the UT-Houston M.D. Anderson Cancer Center and funded by the National Cancer Institute, analyzed the destructive effects on brain tumor stem cells of mice by introducing a tailored adenovirus (Delta-24-RDG). By tailored adenovirus, I mean a specific virus produced by scientists. This was tested on the most aggressive brain tumor, glioblastoma multiforme, which is known to be resistant to chemotherapy and radiation. The particular intrigue in this project stems from their attempt to build on well-known and studied research performed in 2003. 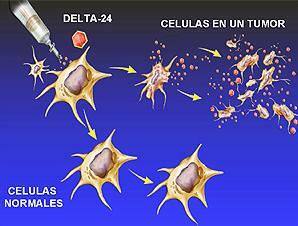 The 2003 study found that Delta-24 eliminated brain tumors in 60% of mice. The recent study however, was conducted on the actual stem cells that drive the continued tumor growth postoperatively, hence the testing on glioma stem cells. This led to a direct comparison in survival time between the control group (received no intervention) and the treatment group (received Delta-24 injection). The survival time of the mice who received treatment nearly doubled that of the control group. The result is obvious: the mice that received the injection of the adenovirus demonstrated prolonged life-spans. The success of the study did not simply end there. The researchers attempted to analyze more than mere cause and effect. They sought to gain information on the actual physiological process contributing to the death of the stem cells in the brain. For the first time, adenovirus-mediated cell death (by autophagy) was noted as the direct method of cellular death in tumor stem cells of the brain. It was also noted that the therapeutic virus did not alter normal brain tissue. This finding carries with it tremendous hope because the tumors formed in the brains of these mice closely resemble brain tumors in humans. This resemblance lies in their irregular form and invasive metastatic, or spreading, properties. The study did mention the limitations of these findings and the need for further research, but it does postulate an exciting and possible method of cancer treatment, which may not be limited to the brain. This study only hints at the remarkable and constant efforts put forth by cancer researchers. One must remember that our race for a cure is not a sprint, but an ongoing marathon that must be carefully and methodically ran. 1) Fueyo J, Alemany R, Gomez-Manzano C, Fuller GN, Khan A, Conrad CA, Liu TJ, Jiang H, Lemoine MG, Suzuki K, Sawaya R, Curiel DT, Yung WK, Lang FF. Preclinical characterization of the antiglioma activity of a tropism-enhanced adenovirus targeted to the retinoblastoma pathway. J Natl Cancer Inst. 2003 May 7;95(9):652-60. PMID: 12734316. 2) Jiang H., Gomez-Manzano C., Aoki H., Alonso M.M., Kondo S., McCormick F., Xu J., Kondo Y., Bekele B.N., Colman H., Lang F.F., Fueyo J. Examination of the therapeutic potential of Delta-24-RGD in brain tumor stem cells: role of autophagic cell death. J Natl Cancer Inst. 2007 Sep 19;99(18):1410-4. PMID: 17848677.